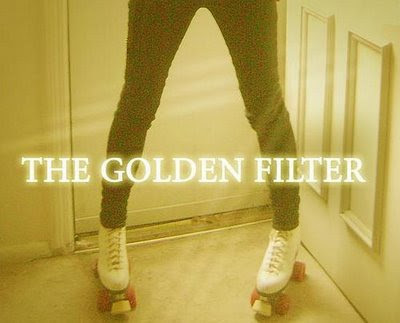 I saw Golden Filter at the Coachella Good Life party on Sunday at the Viceroy which was actually a really fun event. Free booze and food was passed while the homie Spank Rock killed as people did flips off the stage and into the pool. Doug E Fresh even came out and beatboxed while Naeem and the Ninjasonik dudes freestyled. I got a farmer's tan. Insane day. Anyway, back to The Golden Filter. They are a three piece electro-pop group with a Little-Boots-y girl singer. I could only dig up their single "Solid Gold" and a Cut Copy remix they did, but be on the lookout for them down the line. I know they have a bunch of songs because they played for over an hour at the party (including a cover of The White Stripes' "The Hardest Button To Button").